On or around January the 7th, a Gentlemen’s Club estate next to DistrictX on the Decentraland virtual world was sold for $14,000 Mana tokens. On or around January 16th, another big estate that boasts of being “strategically located in exclusive area, touching 2 main roads, near District X & Fashion Street,” sold for about $30,000. Both lands appear to have been held for about 13 months prior to their sale ahead of a potential launch of the ethereum based Decentraland virtual world this summer. The above may have an effect on about $1.5 million worth of private land located around the district out of an estimated $40 million of all Decentraland and its many districts. The effect could be as much as a drop of -50% of land prices around DistrictX according to an investor who does not want to be named. He says he is quite active in the Decentraland marketplace and the land that sold for $30,000 could have attracted $80,000 due to its strategic location. The timing of the trade, he says, and the fact that both estates were sold relatively cheap, raises suspicions of insider trading by someone who may have been informed of the leadership change and pivot decision. 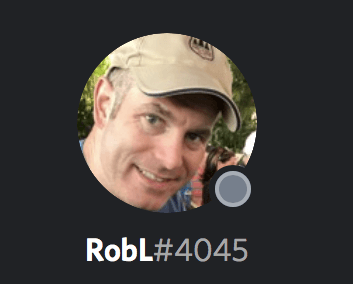 RobL refused to name himself and, despite having a face picture, said he is anonymous. Raising the question of how anyone can know whether someone from this team, which made the pivot decision, engaged or did not engage in Decentraland trading before the above two screenshots were leaked. Leaked from what appears to be a private chat of contributors only, with contributors being investors in the District through buying a bit of district land. Decentraland is an ethereum based virtual world where ownership of the land itself is passed through an ethereum address by the use of smart contracts. Cryptokitties, basically, but for virtual land. This virtual land has a private land market where anyone can build what they want and a sort of public space called districts. The public spaces have their own themes. So for DistrictX, the theme is adult content. Other districts have the aim of building a hacking space where coders sit and develop, or a Pokemon like adventure world and so on. Contributors could invest in these public spaces by effectively buying part of the land to then lease it for rent or to gain what profits there may be from the district which could charge for entrance to say an adult show. Making it all quite at the edge of Virtual Reality, blockchain, and so on, but some districts perhaps got a bit too ahead of themselves. So says a site primarily dedicated to Decentraland movements. The districts that dissolved, however, were not of that great interest to many, while DistrictX was apparently one of the more popular area for, presumably, obvious reasons. 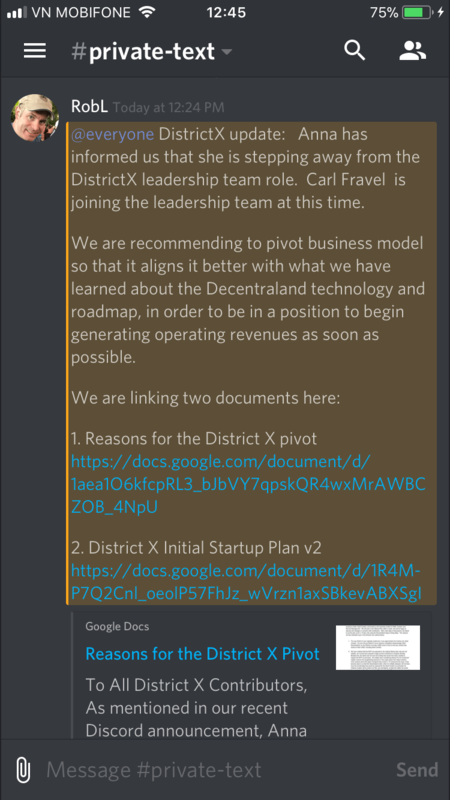 “There are internal discussions occurring, as they always have, that are contributors privileged only,” RobL says regarding the potential plans for DistrictX in light of the above two screenshots. Recently he posted on Discord an invite link for contributors with 18 joining. There are just over 340 contributors to DistrictX, RobL says. “This is a lot of money involved and they are going from district X (we all know what it means) to possible different kind of district. Then value will drop 50% of the ones who bought last 7-8 months. So I think they need to clarify whats up. We are investors too,” says the private investor and owner of surrounding land who did not want to be named. Raising the question once more of how you maintain a level of fairness in a somewhat hybrid system where there is community participation and say, but there are also a select few tasked with building things. A complex question that generally applies to all open source projects with solutions to that tension between builders and the rest remaining elusive. Decentralized Autonomous Organizations (DAOs) were promised as at least an experiment that may provide an answer, but they remain effectively not utilized at all. Making one wonder whether hierarchy in decentralization is not actually the order of the day. A co-ordinating select few against the un-coordinating masses. A theme that may well define this entire century.